Like any good fishing lure story, the original Chatterbait was invented and manufactured in a garage by a tinkering fisherman. Soon Ron Davis Sr.’s invention would lead to some smashing tournament success around the Southeast. Little did he know how his lure would explode in popularity and single handedly spawn an entire category of lures. To meet demand for his product, he contracted with Z-Man for their manufacturing and marketing abilities. Knowing how the fishing tackle industry can be rife with copycats, Davis was smart and had protected his design with a US Patent, which he eventually sold the IP rights over to Z-Man. 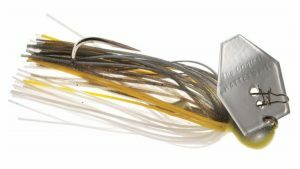 Today there are many other bladed swim jigs on the market, each of which found their own unique way to bypass the Z-Man patents. I have personally tried many different brands of bladed swim jigs and trailers. Each of these chatterbaits are easy to fish, especially for new bass fishermen. This guide goes into detail of why each one deserves a slot in your tackle box. The Chatterbait Elite is basically identical to the original Chatterbait, but with a few key improvements. 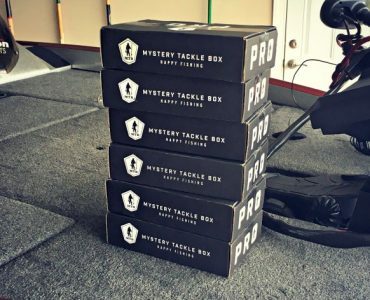 It is the bait that Paul Mueller set the single day Bassmaster Classic weight record, with an incredible 5 fish limit of 32 pounds and 3 ounces. This bait still features an Arkie style jig head, matching silicone skirt and a sticky sharp 5/0 Gamakatsu hook. The upgrades is where things get interesting. The coffin blades are now thicker and stronger while maintaining the solid vibration. Gone are painted blades that can scratch and chips, and are now all electroplated. The line tie is upgraded from a thin wire snap to a Mustad Fastach Clip. Finally, Z-Man has added an integral bait keeper to the shank of the hook which holds trailers much better. If you like to burn your bladed jigs a few feet down and not rise to the surface, it’s hard to beat a Chatterbait. Strike King put 3 years of R&D into the design and testing of the Rage Blade. 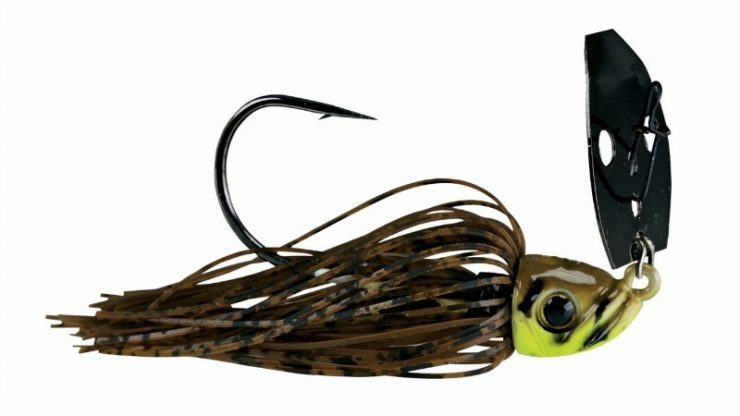 Bass anglers were rewarded with a truly unique bladed swim jig. The Rage Blade is fundamentally different from all the other Chatterbaits out there thanks to the clever way the weight is integrated into the blade, rather than on the hook. The integrated head and blade actually makes the lure less prone to snag on cover. When the head hits wood or rock, the weight is able to deflect and pivot on the oversize eye of the hook. Not as good as a spinnerbait, but really good for a bladed swim jig. The other advantage of this design is the ability to fish extremely slow while still getting a quality thump. The ability to slow roll at greater depths with baitcasting gear is what makes the Rage Blade unique. The hook is a custom heavy wire 4/0 Gamakatsu and has a 3/32 oz skirt collar with keep molded onto the shank. Fish the Rage Blade with 15-17 fluorocarbon or 30lb braided line on a Medium Heavy rod. The Yamamoto Zako or any paddle tail swimbait will make a great trailer. The Shock Blade has a big swim jig style head with 3D eyes on a big Mustad hook. 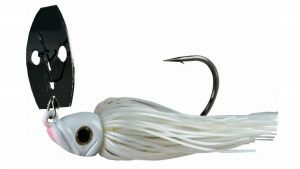 The jig and hook are perfectly sized for a bulky shad style trailer like a Yamamoto Zako or Lake Fork Magic Shad. The skirt is bulky and has both short and long strands that create a seductive pulse in the water. To get around the Z-Man patents, Picasso crimps a metal ring around a hole in the blade. Don’t worry about that piece bending because it’s really a strong connection. The blade itself is sort of a snubbed off teardrop shape, with a curved bill and two holes. The blade really works well, and has always generated good thumping action at a slow to medium retrieve. The 3/8 and ½ ounce are awesome for fishing in 6 feet or less. The Shock Blade is unique in that it comes in a bunch of bigger sizes. No other bladed jig is available in 1, 1-1/2, and 2 ounce models. 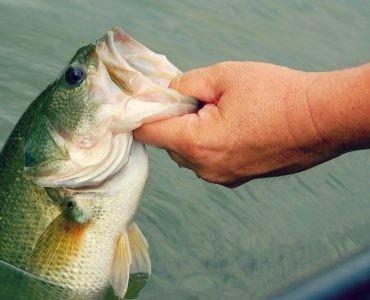 That may sound too heavy, but that opens the possibility of fishing these in much deeper water. A 1 ounce plus jig can be slow rolled down ledges and across deep points and humps. 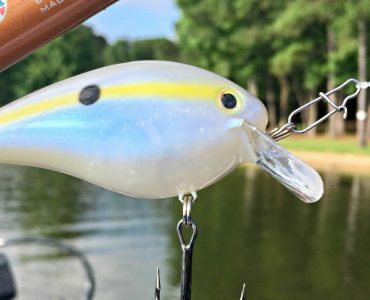 When fish won’t bite a deep diving crankbait, now you can thump the Shock Blade deep to trigger a bite. A vibrating jig is not complete until you select a trailer. Your trailer gives the lure bulk and should imitate the local forage. If your lake is full of shad, use a fluke or swimbait style trailer. If the bass are keying on bluegill, thread on a Zako or Magic Shad for a larger profile. The deal is to “match the hatch” as best you can. Below are my all time favorite trailers for bladed jigs. Zoom Super Fluke – The Super Fluke is probably the first and most used trailer for the original Chatterbait. It works well when small shad are in the area you are fishing. The profile is big enough to look like small shad, but compact enough to glide at all retrieve speeds. The Super Fluke doesn’t have a lot of action on its own, but the vibration of the jig will make the forked tail quiver and shake. Strike King Rage Twin Tail Menace – The Menace is an underrated chatterbait trailer. It also creates a contrasting look compared to swimming style baits. Instead of a back and forth wobble, the Twin Tail Menace has a flapping motion with its legs. The flappers on the bait can be left attached or split apart for two completely different actions. Yamamoto Zako – The Zako is an awesome trailer for creating a bulky profile and a swimming action. The Zako has a segmented body, so the thumping jig imparts a tantalizing swimming motion. Be like Elite Series pro and bladed jig master Brett Hite and grab the Zako (or the similar Lake Fork Magic Shad) when trying to imitate bluegill or big shad. Strike King Rage Swimmer – The Rage Swimmer is an awesome boot tail swimbait that is great on a chatterbait or regular skirted swimjig. Any paddle tail will work as a trailer really. Where the Zako has a side to side swimming motion, a paddle tail has a wobbling effect. Yamamoto Swimming Senko – The paddle tail Senko is a compact swimbait style trailer that works great when the fish don’t want the bulkier swimbaits. It gives off a more subtle kicking action as well that can be killer on pressured fish. The Senko is a little long for a vibrating jig, so be sure to experiment with cutting off a portion of the worm to create a good profile. Any of these vibrating jigs and Chatterbaits combined with one of the trailers will be effective fish catchers. Anglers should try out the different styles to see which one works best for their home lakes. Get a couple different weights to experiment with running depth and retrieve speed. Once you have some combinations you like, keep it tied on and learn to fish them in every type of cover you come across. 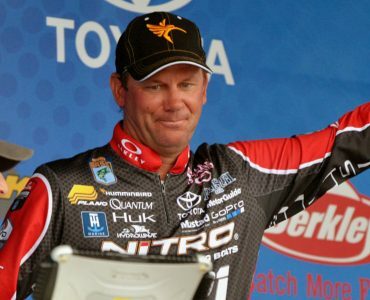 Here are some of my top chatterbait fishing tips.